After spending much of 2016 stacking rigs and laying off workers, some shale gas drillers are coming off the bench in response to gas futures prices above $3/MMBtu, with $4/MMBtu gas possible in 2017 as demand briefly outstrips production, Sanford C. Bernstein & Co. analysts said. But a $4 handle would be "a short-lived window of opportunity," they said, as the combination of the mighty Marcellus Shale and Haynesville and Fayetteville shale production adds volumes to drive prices back down. Right now, according to Bernstein's calculations, there are half the number of "Marcellus-equivalent" rigs working in the U.S. — 52 — as are needed to keep supply flat over the next 12 months. For its Marcellus-equivalent calculation, Bernstein calibrates rig counts to compare with production in the powerful northeast Marcellus. Shale gas production, which is prone to rapid declines in the first two years of a well's life, will keep falling as producers conserve cash while export demand is growing, the analysts, led by Jean Ann Salisbury and Bob Brackett, said in a Sept. 28 note to clients. This should reinflate prices, they said, possibly above $4/MMBtu. Officials in Belmont, Monroe, Harrison and Jefferson counties saw their total sales tax revenues jump by more than $21 million during the five years of the Marcellus and Utica shale boom, according to an industry-backed group. Would you like to read more. Just click here! The biggest reboot of U.S. oil and gas rigs in two years will gain traction as higher prices prompt producers to resume investment in the most profitable plays, according to a report by Platts RigData. Producers from EOG Resources Inc. to Pioneer Natural Resources Co. are putting rigs back to work and buying acreage in some of the higher-return plays as they gear up to resume growth after crude prices rebounded. Oil got a further boost on Wednesday when the Organization of Petroleum Exporting Countries agreed on the outline of a deal that will cut production for the first time in eight years. Futures jumped as much as 6.2 percent in New York, extending their rally from this year’s low to about 80 percent. Was OPEC Too Late in Changing Policy on Production Cuts? In an article I wrote earlier this year — OPEC’s Trillion-Dollar Miscalculation — I speculated that if OPEC could go back in time to November 2014 we would likely have not seen oil prices crash as they did. Because at that time the cartel embarked upon a course of action that arguably had far greater financial repercussions than they expected. To review, OPEC, which is responsible for over 40% of the world’s oil production, has long attempted to function as the world’s swing producer for crude oil. If the world needed more oil production, OPEC would bring more barrels online. If demand declined, some production could be idled. The group believed that a stable price was the key to matching global supply and demand. Agreeing to production quotas was always a messy process, with competing factions within OPEC frequently having clashing objectives. But Saudi Arabia is by far OPEC’s largest producer, and the group historically falls in line with its desires. And that desire in November 2014 was to abandon the objective of attempting to balance the market. Following that meeting OPEC announced that it would defend market share that was being lost, in particular to rising shale oil production. Chesapeake Energy Corp. said Thursday it has received subpoenas from the U.S. Department of Justice (DOJ) and some states in connection with an investigation into whether it violated antitrust laws regarding natural gas and oil leasehold purchases, royalty payment practices and accounting methods for acquiring and classifying properties. In a U.S. Securities and Exchange Commission Form 8-K filing, the Oklahoma City-based producer reiterated an earlier disclosure, that it was subpoenaed by DOJ and state government agencies in connection with potential violations of antitrust laws relating to its purchase and lease of gas and oil rights. The filing also indicated that Chesapeake has received DOJ, U.S. Postal Service and state subpoenas "seeking information on our royalty payment practices. In addition, we have received a DOJ subpoena seeking information on our accounting methodology for the acquisition and classification of oil and gas properties and related matters." Chesapeake Energy Corp. said two of its directors, including a representative of No. 2 investor Carl Icahn, resigned effective Monday, less than a week after Icahn reduced by half his stake in the Oklahoma City-based natural gas producer. In a Form 8-K filing with the U.S. Securities and Exchange Commission, Chesapeake said John Lipinski, who was appointed in June 2014, and Icahn director Vincent Intrieri, appointed in June 2012, had resigned. According to the filing, the decision by both men was "not the result of any disagreement with the company on any matter relating to its operations, policies or practices." Lipinski had served on the audit and compensation committees. Intrieri, who was named to the board at Icahn's behest, has worked for Icahn-related entities since 1998. He served on Chesapeake's audit, finance and nominating, governance, and social responsibility committees. Traina, along with officeholders, contractors and port authority staff, cut the ribbon on the $5.1-million crane and conveyor system Sept. 23. The project was partially funded by a $3.5-million loan from Ohio Development Services, which could be changed to a grant, Columbiana County Commissioner Mike Halleck said. The timing of the opening of the new crane comes at an incredibly opportune time, Traina adds, noting the soon-to-begin construction of an ethane cracker plant in Monaca, Pa., just 25 miles upstream from Wellsville, and a proposed cracker plant in Belmont County further downriver. “We’re poised right in the middle of all that growth,” the director said. 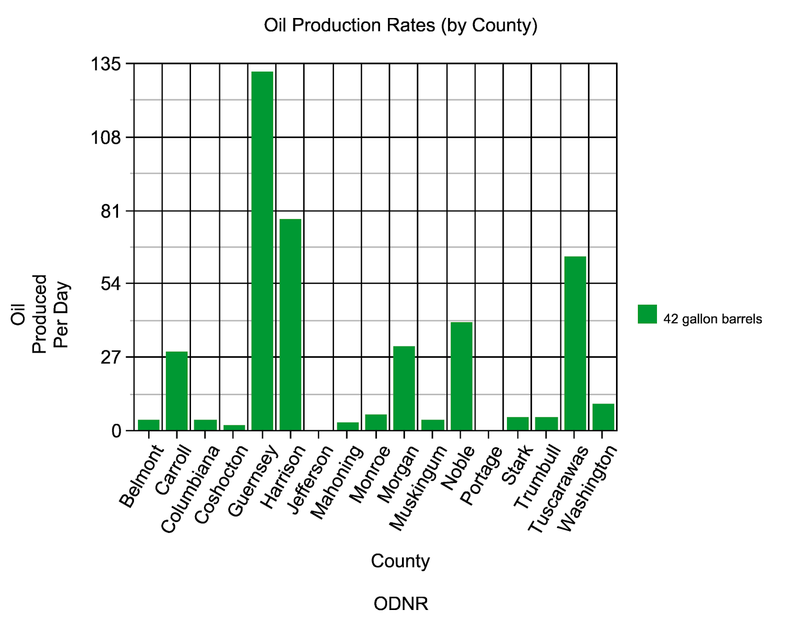 Production decline curves in the Utica Shale are impacted by a number of variables. In the first place, there is a natural decline over time, gas and liquids are finite and production inevitably declines. Fracking impermeable rock generates a flow path for trapped hydrocarbons and initial production can be quite large, though decline is inevitable as fractures and proppant no longer sustain flow and reservoir rock releases what it can. Unlike traditional wells where relatively porous and permeable rock is highly prized for it natural ability to permit hydrocarbons to enter the well bore and move to the surface, unconventional wells require coaxing via fracking. The fracking creates finite induced pathways for hydrocarbons to enter the wellbore and move up to the surface. All wells use a choke valve which gives the operator control over how quickly hydrocarbons are allowed to escape out of the wellbore. Chokes valves are adjusted for a number of reasons and subject to experimentation and testing to optimize results. Reasons for choke adjustment could include: limiting choke in an attempt to maximize long term total production and flattening decline curves (experimental and based on learning and history), or maximizing or minimizing choke for other economic reasons. Click here to read more and view a graphic illustrating the decline curve. Rice Energy executives say the key to its pending $2.7 billion acquisition of Vantage Energy is the 85,000 acres of natural gas holdings it will gain in Greene County, many of them adjacent to Rice's own holdings in the middle of the most productive part of the Marcellus Shale. Rice Energy (NYSE: RICE) made headlines Monday with its surprise announcement that it was acquiring Colorado-based Vantage Energy, which the company said would be a "transformational" move on the part of the Canonsburg natural gas driller. And in a conference call with analysts Tuesday, Rice executives pulled back the curtain on some of its strategy when the deal closes. One major takeaway: The acreage in Greene County, where Rice said it will focus much of its attention. “The fact that we can do it in our backyard makes it that much more appealing,” said Daniel Rice IV, CEO of Rice Energy. Note: The two vertical axes are scaled to present oil and natural gas production in roughly energy-equivalent terms. Production of oil and natural gas in the Appalachian Basin's Utica play—which includes both the Utica and Point Pleasant formations—has increased significantly since 2012. Monthly natural gas production from Utica wells increased from 0.1 billion cubic feet per day (Bcf/d) in December 2012 to more than 3.5 Bcf/d in June 2016. 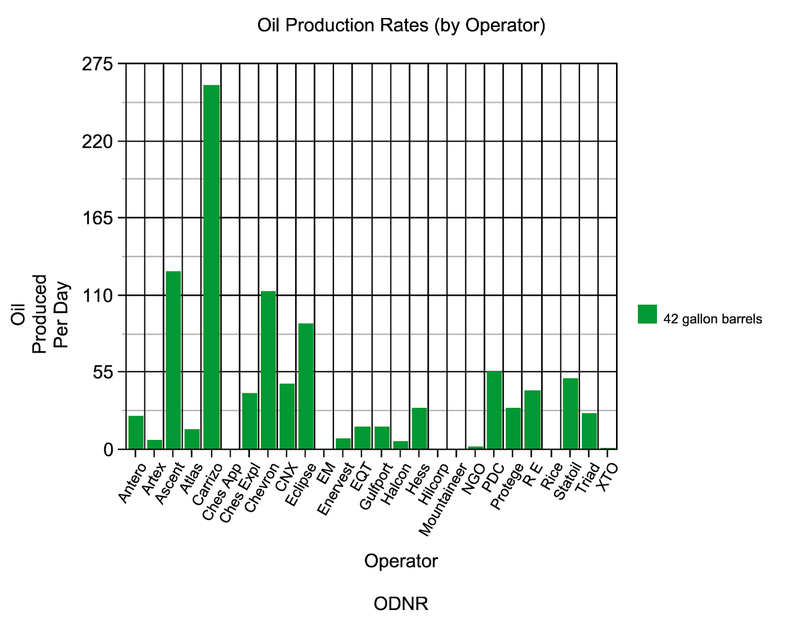 Oil production increased from 4,400 barrels per day (b/d) to nearly 76,000 b/d over the same period. 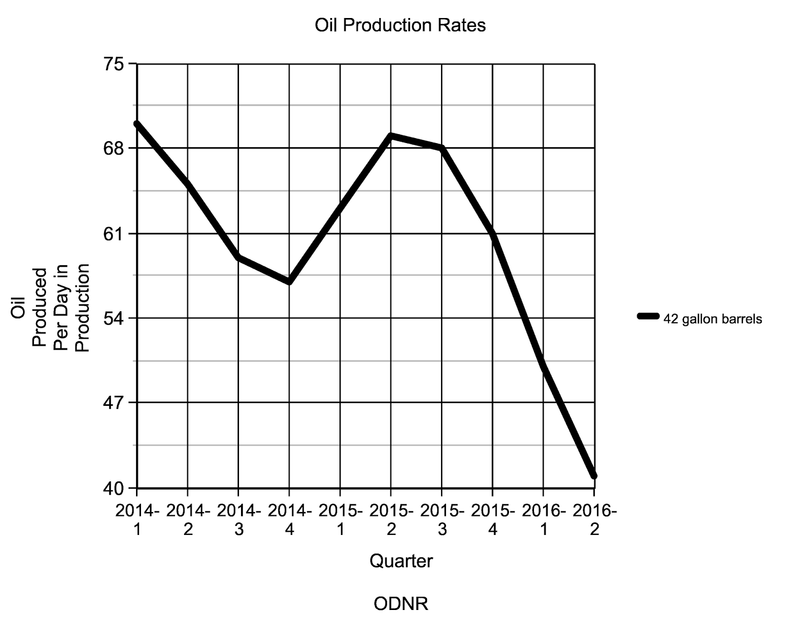 Note: EIA calculates the daily production rate for each well using the initial six contiguous months of liquid and gas production expressed in barrels of oil equivalent per day. Click to enlarge. Only 104 wells in the Utica play produced oil or natural gas in 2012, with most wells coming into production in 2013 or later, as shown on the maps above. Although the Utica play produces a mixture of oil and natural gas, recent development in the Utica has focused on natural gas. The rapid growth in Utica/Point Pleasant natural gas production since 2012 is attributable to increases in drilling efficiency, proximity to markets, improvements in business processes, resource targeting in stacked plays, and the lengthening of horizontal laterals. Relatively low oil prices and expansions in natural gas infrastructure make the natural gas-rich portions of the reservoir more desirable for development, and therefore, increasingly the target for operators. The relative portions of natural gas and oil in a particular formation can be represented by mapping initial gas-to-oil ratios (GORs). GORs characterize the ratio of natural gas to oil produced from a well, expressed in standard cubic feet per barrel—scf/b. The distribution of oil and natural gas in a formation is partially controlled by the thermal maturity of a rock, which is an indication of potential hydrocarbon generation. Crude oil and natural gas are produced by the heating of organic materials (i.e., kerogen) found in some rocks over long periods of time. When organic-rich rocks, usually shales, are buried, they are exposed to increasing temperatures and pressures. Heating causes the organic matter to change into the waxy material known as kerogen, then into oil, and finally into natural gas as the temperature further increases. 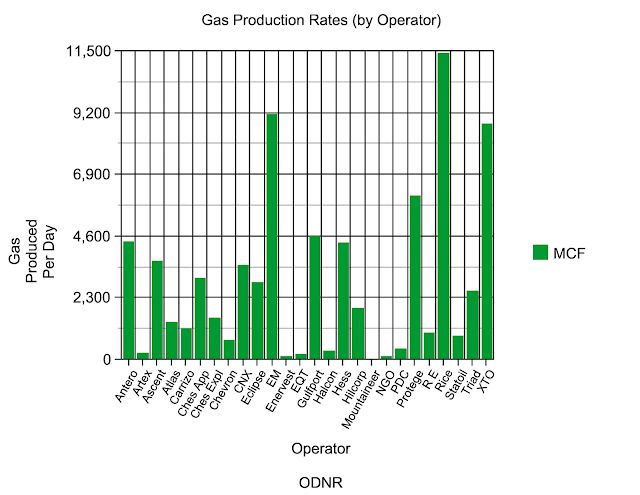 Note: EIA calculates GOR for each well using the initial six contiguous months of liquid and gas production. Click to enlarge. The temperature ranges conducive to converting organic material to oil and natural gas are referred to as the oil window and the gas window, respectively. The oil window typically occurs at temperatures between 60 degrees and 120 degrees Celsius, while the natural gas window occurs between 100 degrees and 200 degrees Celsius. Although this temperature range is found at different depths below the surface throughout the world, a typical depth for the oil window in the Utica play is 4,000 feet to 8,000 feet, and the corresponding gas window is 7,000 feet to 12,000 feet. 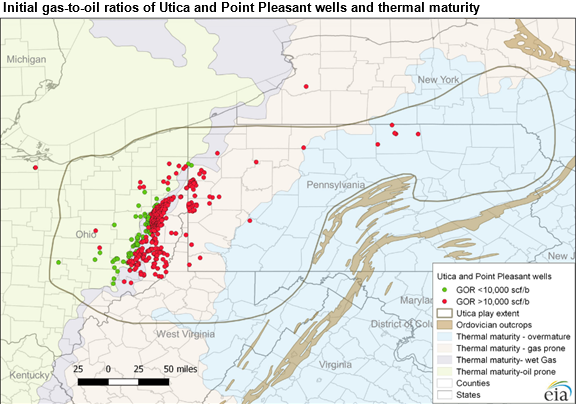 In the map above, natural gas-rich wells in the Utica play are mostly located in the eastern portion of the play, and oil-rich wells are typically located in the western portion. The distribution of initial GORs generally corresponds to the depth of the reservoir. Deeper wells (up to 13,000 feet) in the eastern portion have higher initial GORs (greater than 10,000 scf/b) and produce mostly natural gas, while the shallower wells to the west have lower initial GORs (less than 10,000 scf/b) and produce mostly oil. Recent updates to EIA's maps and geologic information for the Utica play help to describe the formations' production, gas-to-oil ratios, and other geologic characteristics. This information provides a better understanding of recent production within the context of key geologic parameters. The latest weekly Utica shale permitting report from the Ohio Department of Natural Resources reveals that activity picked back up a bit last week after no permits were issued the previous week. Five new permits were issued last week, while the rig count jumped back up to 18. 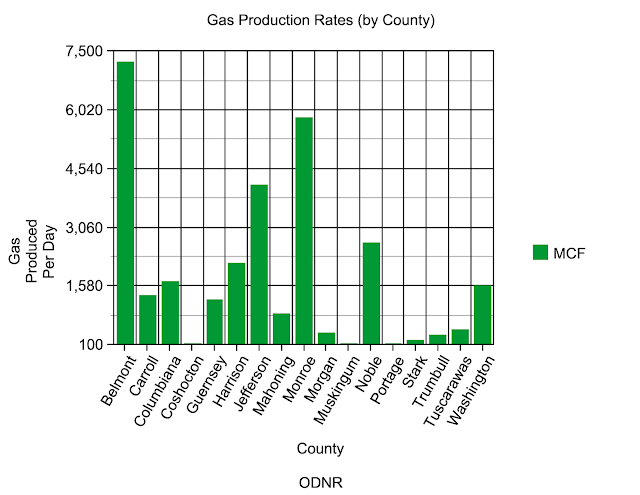 2,246 permits are now issued, 1,800 wells drilled, and 1,398 wells are producing in Ohio's Utica shale. Oil prices settled up nearly 6 percent on Wednesday after OPEC struck a deal to limit crude output at its policy meeting in November, its first agreement to cut production since 2008 and after the market crashed on oversupply. The Organization of the Petroleum Exporting Countries reached agreement to limit its production to a range of 32.5-33.0 million barrels per day (bpd) in talks held on the sidelines of the Sept. 26-28 International Energy Forum in Algiers, group officials told Reuters. OPEC estimates its current output at 33.24 million bpd. "We have decided to decrease the production around 700,000 bpd," Iranian Oil Minister Bijan Zanganeh said. OPEC will agree to production levels for each member country at its Nov. 30 meeting in Vienna, group officials said. After reaching its group target, it will seek support from non-member oil producers to further ease the global glut. This news, which many no doubt feel is long overdue, pushed oil prices up to the highest levels seen in recent weeks. Brent Crude reached as high as $48.96 before settling at $48.69, while West Texas Intermediate (WTI) rose to $47.45 before finishing the day at $47.05. It has been a big week for new natural gas-fired power plants in Ohio. First, a previously announced $1.1 billion project in Columbiana County got approval from the Ohio Power Siting Board, and construction is scheduled to begin in January 2017. Then a $900 million investment for another plant in Harrison County was announced. Ohio regulators have approved a $1.1 billion natural-gas-fired power plant in eastern Ohio, a project that locals say will significantly boost the area. The Ohio Power Siting Board gave the go-ahead to Boston-based Advanced Power Services on a 1,105-megawatt power plant in Columbiana County. It's enough to power about a million homes, the company said. The county, one of the prime spots for oil and gas development related to Ohio’s Utica shale play, has $4.4 billion of tangible assets, County Commissioner Tim Weigle said in recent regulatory testimony on the plant, operated by subsidiary South Field Energy. “So they’re willing to invest one quarter of our entire worth in Columbiana County. That is extreme,” he said in support of the plan. The Harrison County Community Improvement Corporation announced Thursday that a 1,000 megawatt natural gas-fired electrical power generation facility will be constructed in the Harrison County Industrial Park. The facility will provide enough electricity to power a million homes and bring capital investment of more than $900 million to Harrison County, according to Raj Suri, CEO of EmberClear, the company that will build the facility. The U.S. economy would be "much weaker" if the energy renaissance had not occurred, the U.S. Chamber of Commerce said in a report outlining the jobs and financial gains resulting from unconventional drilling. Researchers also highlighted some of the biggest benefactors: Ohio, Pennsylvania, Texas and Wisconsin. The report, "What if America's Energy Renaissance Had Not Actually Happened?" is the second in a series by the Chamber's Institute for 21st Century Energy. Researchers compiled data from 2009 through 2015 to imagine the U.S. economy minus the plethora of oil and natural gas reserves uncovered in shale, sand and other formations now being tapped by hydraulic fracturing and horizontal drilling. "The 'Keep It in the Ground' movement completely ignores the vast benefits to our nation's economy that the energy renaissance has brought to us," Institute CEO Karen Harbert said. "For instance, lower electricity and fuel prices spurred a comeback in manufacturing that alone is responsible for nearly 400,000 jobs. It costs consumers less to drive a car and heat their homes today. And all the while, our nation has been decreasing its energy imports and lowering emissions." Because of the energy renaissance, U.S. natural gas import levels have declined by 73%, while oil imports have fallen by 62%, the researchers said. The whole article is available by clicking here. Republican presidential nominee Donald Trump on Thursday accused his Democratic opponent of seeking a “war on energy,” and promised to slash regulations that he says are holding back fossil fuels. Hillary Clinton’s energy policies would cost the United States $5 trillion, Trump said in a speech at a natural gas conference. He added that Clinton wants “to put the coal miners out of work, ban hydraulic fracking in almost all places and extensively restrict and ban energy production on public lands and in most offshore areas." Trump used the speech in Pittsburgh, the heart of the Marcellus Shale gas boom of recent years, to pitch his energy, economic and tax agendas to gas executives. He spoke highly of what the gas boom, spurred by hydraulic fracturing, has done to the country’s economy and security. “North American producers are rapidly increasing efficiency and reducing production costs, and we’re just at the beginning of this innovation curve,” says Select Sands Corp.CEO Rasool Mohammad. A senior Environmental Protection Agency official privately complained about “dickheads” in the White House who resisted efforts to regulate an innovative oil and gas extraction technique, newly released documents show. “If you want any hope of regulation of fracking then give us more time to try and remove the gun from our head and talk sense into OMB dickheads,” Goo wrote to John Coequyt, the Sierra Club’s top climate policy official and one of its team of D.C. lobbyists. Goo and Coequyt worked extensively behind the scenes to craft major EPA policies under Obama, including, these text messages show, the agency’s first major fracking regulations. Activist investor Carl Icahn has exited more than half of his stake in Chesapeake Energy Corp., citing tax-planning reasons. Mr. Icahn reported a 4.55% stake in the energy company, compared with 9.4% in August. Chesapeake shares fell 4.4% to $6.51 in after-hours trading. The Ohio Supreme Court ruled Tuesday that Secretary of State Jon Husted and the election boards from three counties did not violate the law when they rejected proposed county charters that, if successful, could have led to local bans on oil and natural gas development. In a slip opinion, the state's high court ruled 6-1 that supporters of the proposed charters were not entitled to a writ of mandamus that would have placed the charters on the ballot in November. The case is State ex rel. Coover v. Husted [No. 2016-Ohio-5794]. According to court records, election boards in Athens, Meigs and Portage counties rejected the proposed charters for a variety of reasons last year. Husted subsequently invalidated similar petitions in Athens, Fulton and Medina counties (see Shale Daily,Aug. 14, 2015). The latest weekly permitting report from the Ohio Department of Natural Resources shows another decline in activity. No new permits are listed on the report for the week ending September 17. The rig count fell from 16 to 14. There are now 2,240 permits issued, 1,797 wells drilled, and 1,398 wells producing. We're back from vacation (the first time since the inception of The Daily Digger that I've actually taken a week off from this), so things will get back to normal this week. First, though, here are some of the stories that we didn't get to post about last week. While Utica Shale brought much disappointment to many area businesses, at least two companies are confident drilling will resume. The domestic gas and oil industry may have plummeted in Guernsey County and elsewhere around the country, but it will rebound, predicted David R. Hill, a geologist and an oil and natural gas producer from Byesville. Hill offered his assessment recently during a Coffee and Commerce meeting sponsored by the Cambridge Area Chamber of Commerce. He reported that the domestic component of the industry is suffering "pain" because of a decision by the Organization of Petroleum Exporting Countries to flood the world oil markets with an excess supply of crude oil. Kinder Morgan officials said the hundreds of eminent domain lawsuits they filed against landowners in the path of the Utopia Pipeline are just part of the building process, but an attorney representing numerous property owners said the company is just trying to intimidate them into signing “lowball” contracts. Is Chesapeake Energy Planning to Reduce Focus on Utica Shale Next Year? "When you think about the Eagle Ford and you think about a traditional Eagle Ford well that brings on a decent amount of oil and looks pretty good and it costs $2.1 million, that's a pretty attractive set of economics. And now you put that against the higher oil recoveries of a 10,000-foot lateral and doing so at a well cost that's just a little over $4 million, and it's pretty attractive," he said. Dell'Osso said Chesapeake will expend "a little bit more" capital in the Utica Shale in 2017, but its focus remains elsewhere. If the company changes its mind, he said, it has the ability adapt quickly. Ohio EPA has issued five air permits-to-install-and-operate compressor stations intended to facilitate delivery of natural gas along the Nexus Gas Transmission (NGT) pipeline. With oil prices down by more than half since the price collapse two years ago, drillers have cut their exploration budgets to the bone. The result: Just 2.7 billion barrels of new supply was discovered in 2015, the smallest amount since 1947, according to figures from Edinburgh-based consulting firm Wood Mackenzie. This year, drillers found just 736 million barrels of conventional crude as of the end of last month. How Have Landmen Responded to the Oil and Gas Industry Downturn? This is Mark Acree’s fifth oil and gas downturn. He’s been a landman in the business for 37 years and, each time it cycles down, there’s something old and something new. This time, he said, the something old is him. Keep in mind, he’s only 57. It’s been a year and a half since Mr. Acree was laid off from Noble Energy Corp. where he spent three years as a senior land manager. Like many oil and gas firms, Noble has had several rounds of layoffs since the downturn began in 2014, with falling natural gas and oil prices. “I’m used to being a guy who worked for large corporations who pedaled pretty fast,” he said. When the latest downturn hit, the focus shifted to cost-cutting and Mr. Acree believes the land profession has seen some of the worst of it — especially managers with many years of experience and more zeros on their paychecks. It is a good question, one of many that face the industry as it plans for the eventual ramp up of activity that will inevitably come. Read the rest of the article by clicking here. How Are American Consumers Paying Oil Pipeline Taxes? The idea that any business could force you to pay its taxes may strike some readers as beyond belief. When I first heard about this more than a decade ago my skepticism meter hit high alert. Then I started reading the laws, regulations, and official proceedings, none of which made the news. I’ve been writing about it ever since, hoping the public will demand an end to this abuse. The way it works is simple: The Federal Energy Regulatory Commission (FERC) sets the rates that monopoly pipelines can charge. The rates are based on all of their costs—people, equipment, taxes, and the corporate income tax. But that last expense is fake. The pipelines are exempt from that tax. No industry benefits more from the forced payment of taxes for private gain than the pipelines that are the subject of the latest court ruling. Pipelines are monopoly rights-of-way granted by government. The rates that oil pipelines charge shippers—oil companies, airlines, chemical companies—to move their product across the country are regulated under a law first enacted in 1887, the Interstate Commerce Act, which was designed to protect shippers from abuses by railroads—and was partly drafted by those railroads. Natural gas pipelines are regulated under updates to a 1938 law. The public comment period for the NEXUS pipeline's environmental impact statement has ended, and opponents of the project are crying foul. Banding together, representatives from multiple groups are requesting an investigation into what they deem to be hundreds of forged letters of public comment — all in support of the pipeline project. Michigan resident Paul Wohlfarth spent much of the last month investigating letters from 14 people that praise the pipeline(which is set to run in part through Lorain and Medina counties). He said he contacted those people listed as the authors, and what he learned cast doubts upon the record of public comment. In all, Wohlfarth flagged "possibly 200 comment statements" of dubious origin. "This is an extremely serious matter," attorney Terry Lodge wrote in a filing with the Federal Energy Regulatory Commission this week. "In one instance, the party purportedly signing the letter has been deceased since 1998." Bryan Investment Group is raising a $25 million fund, largest in its 45-year history. The Canonsburg-based family business plans to use the capital to drill wells, but the reason its goal for Bryan Energy LP increased 10-fold is because it is branching into more expensive horizontal wells, President and General Managing Partner Richard Bryan said. Bryan Investment has developed and managed more than 600 natural gas and oil wells, located in Pennsylvania, Ohio, Kentucky and Wyoming, since 1971. It initially raised money for other drillers, “bigger players like Atlas,” he said. But about 10 years ago, it decided to open its own drilling company. Today, the Ohio Environmental Council and the Clean Air Task Force released a new analysis showing that 7,129 childhood asthma attacks in the Columbus metro area, and 7,558 in the Cleveland metro area each year are due to smog resulting from oil and gas operations. The Ohio Environmental Council is an activist organization that is firmly opposed to oil and gas drilling. Wayne County is now on the clock. The phrase is overused as it relates to the NFL's rookie draft, but it was essentially the message from a Farm Bureau official to residents and elected officials throughout Wayne County during a series of meetings regarding the NEXUS pipeline project. Because of the possibility the NEXUS pipeline could be rerouted from the northeastern corner of the county to the southern and western portions of Wayne, the Wayne County Farm Bureau has been organizing these meetings led by Dale Arnold, director of energy for the Ohio Farm Bureau Federation based in Columbus. Arnold has been talking to farmers, property owners, concerned citizens and elected officials to stress how important it is for them to share comments with the Federal Energy Regulatory Commission.To the Chippewa Township trustees and residents in and around Doylestown, the NEXUS pipeline is nothing new. They have been battling its potential construction on every front. As Trustee Lenny Broome said, he and his colleagues want to see it rerouted and moved out of the township. The Ohio Department of Natural Resources has now released the production data from the Utica shale for the second quarter of 2016. As always, we are going to give you a look at how the numbers compare to past quarters, past years, and how they break down among the various drillers who are active in Ohio and the counties where they are drilling. We also have the top 10 oil and gas wells detailed below. Continuing the trend noticed in the first quarter results, oil production continues to slide. This time gas production joined in. While overall gas production increased, rates per well and per day in production both dropped.